Srivastava A. Misuse of topical corticosteroids on face: A hospital based clinicoepidemiological study. JDA Indian Journal of Clinical Dermatology. 2018;1:80-82. Misuse of topical corticosteroids (TCS) is common in India. Unrestricted sale and lack of adequate knowledge about TCS are largely responsible for it. Inappropriate use of TCS results in several cutaneous and sometimes, even systemic adverse effects.1 The facial skin, on account of its lesser thickness, is extremely vulnerable to these adverse effects.1, 2 Therefore, this study was carried out to determine various adverse effects of TCS on face and various factors associated with it. All patients presenting to the dermatology OPD, who were found to be using TCS containing products on face inappropriately, were included in the study. The relevant details were recorded in a proforma for analysis and interpretation of data. The data were analyzed using the chi-square test and p value < 0.05 was considered to be significant. The study duration was three months. A total of 163 patients were included in the study, including 84 males and 79 females (Table 1). Amongst these patients, 140 (85.89%) had applied TCS on face alone, while the remaining had applied on other body parts as well. The most common primary dermatosis was acne (71; 43.56%), followed by melasma and other pigmentary disorders (43; 26.38%), while 20 (12.27%) patients had been using these products without any disease (Table 2). The duration of use varied from 1 week to several years (Table 3). The most common TCS compound in the study was betamethasone valerate (69; 42.33%) followed by clobetasol propionate (57; 34.97%) [Table 4]. The composition of various products used by patients is shown in table 5. Various cutaneous adverse effects on facial skin are depicted in table 6 and figures 1 – 5. Table 2: Primary dermatoses for which TCS preparations were being used. Table 3: Duration of TCS abuse. Table 4: Topical corticosteroid compound in the products. Table 5: Composition of products used by patients. Table 6: Cutaneous adverse effects noted in the study. Easy availability of TCS preparations, even without a prescription, has resulted in their widespread misuse in India. Various studies focusing on cutaneous adverse effects of TCS compounds have been conducted in India.3 – 6 Since facial skin is relatively thinner, it is more vulnerable to these adverse effects. In previous Indian studies, 4-6 proportion of females has been reported to be relatively higher, but in the present study, it was found to be almost equal (M: F:: 1.063). This can be attributed to overall low attendance of females in OPD, as well as, it might reflect increased cosmetic concern amongst males too, thus making them vulnerable to misuse of various products available in the market. This fact is further substantiated by the fact that the most common affected age-group was 21-30 years; an age-group which is commonly concerned about one’s appearance. The most common primary dermatosis in the present study was acne followed by melasma. This is in accordance with a previous study 6 conducted in Punjab. Although some patients (12.27%) had been using TCS as a part of routine skin care, without any skin disease, the proportion of such patients was relatively small in the current study. The most commonly used TCS compound noted in the study was betamethasone valerate followed by clobetasol propionate. Similar results were reported by Jha et al.4 Further analysis of product composition revealed that steroid with antibiotic combination was the most commonly (31.9%) used followed by an irrational 4 drug combination containing clobetasol, ofloxacin, ornidazole and terbinafine (28.22%). Modified Kligman formula was being used by 19.01% cases. The most common adverse effect noted in the study was aggravation of acne, comedone formation or acneiform eruption followed by topical steroid – dependent facies (TSDF) and steroid modified dermatophytosis. TSDF is a relatively newer entity in context of TCS induced local adverse effects, described in 2008.2 It is defined as the semi-permanent or permanent damage to the skin of the face precipitated by the irrational, indiscriminate, unsupervised, or prolonged use of TCS resulting in a plethora of cutaneous signs and symptoms and psychological dependence on the drug.2 Various terms were initially coined for these cutaneous signs and symptoms such as dermatitis rosaceiformis steroidica, red skin syndrome and steroid-induced rosacea-like dermatitis.7 – 9 In the present study, TSDF was noted in approximately one-third cases. These patients presented with complaints of facial erythema, which was either persistent or aggravated with sun exposure, burning, itching, stretching sensation, scaling and thinning of skin. These symptoms were promptly relieved on self application of TCS and recurred on stopping, which forced the patients to use them again and again, thus creating a vicious cycle of TCS abuse and dependence. Here the classical history of prompt improvement on reapplication of TCS points towards steroid dependence. Previous studies indicate that self-medication, trust on chemist and advice of family and friends, along with ignorance of non-dermatologist prescribers contribute to misuse of TCS.5, 10-12 These prescribers usually try to cover up all possible etiologies as the diagnosis is not known, thus prescribe irrational combinations. Also, we need to note that the cost of rational products for the treatment of acne, melasma and dermatophytosis is relatively very high. 12 Thus, prompt relief in symptoms at a lower cost allures the patients to use these products again and again. Lack of adequate dermatologists across the country and lack of awareness about adverse effects of topical medications has resulted in massive misuse of TCS preparations. Misuse of TCS is rampant across India. Adequate regulation to stop the sale of TCS preparation as OTC drug is the need of the hour. At the same time, prescribers need to be made aware of the possible consequences of using TCS inappropriately. Further, a stronger referral system to the dermatologist needs to be developed. Several patients in whom the composition of the used products could not be identified, were excluded from the study, thereby decreasing the actual number of patients with TCS abuse. Figure 3: Hypertrichosis with modified Tinea faciei. Figure 5: Steroid modified Tinea faciei. 1. Coondoo A, Phiske M, Verma S, Lahiri K. Side-effects of topical steroids: A long overdue revisit . Indian Dermatol Online J 2014;5:416-25. 2. 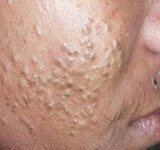 Lahiri K, Coondoo A. Topical steroid damaged/dependent face (TSDF): An entity of cutaneous pharmacodependence. Indian J Dermatol 2016;61:265-72. 3. Dey VK. Misuse of topical corticosteroids: A clinical study of adverse effects. Indian Dermatol Online J 2014;5:436-40. 4. Jha AK, Sinha R, Prasad S. Misuse of topical corticosteroids on the face: A cross-sectional study among dermatology outpatients. Indian Dermatol Online J 2016;7:259-63. 5. Saraswat A, Lahiri K, Chatterjee M, Barua S, Coondoo A, Mittal A, et al. Topical corticosteroid abuse on the face: A prospective, multicenter study of dermatology outpatients. Indian J Dermatol Venereol Leprol 2011;77:160-6. 6. Kaur Brar B, Nidhi K, Kaur Brar S. Topical corticosteroid abuse on face: A clinical, prospective study. Our Dermatol Online 2015;6(4): 407-10. 7. Rathi S. Abuse of topical steroid as cosmetic cream: A social background of steroid dermatitis. Indian J Dermatol 2006;51:154-5. 8. Bhat YJ, Manzoor S, Qayoom S. Steroid-induced rosacea: a clinical study of 200 patients. Indian Journal of Dermatology 2011;56(1):30-2. 9. Rathi SK, Kumrah L. Topical corticosteroid-induced rosacea-like dermatitis: A clinical study of 110 cases. Indian J Dermatol Venereol Leprol 2011;77:42-6. 10. Nagesh T S, Akhilesh A. Topical steroid awareness and abuse: A prospective study among dermatology outpatients. Indian J Dermatol 2016;61:618-21. 11. Sinha A, Kar S, Yadav N, Madke B. Prevalence of topical steroid misuse among rural masses. Indian J Dermatol 2016;61:119. 12. Verma SB. Sales, status, prescriptions and regulatory problems with topical steroids in India. Indian J Dermatol Venereol Leprol 2014;80:201-3.